TL; DR: A highly regarded and affordable option in web hosting, iPage represents more than beginner-friendly shared servers. The company excels by giving customers an unlimited platform of tools and services to create and grow an online presence. From website builders and marketing credits to dedicated servers and a revamped control panel, iPage will assist customers at every phase of their hosting journey. A 20-year-old company that has long enjoyed a reputation for reliability and affordability, iPage has featured a shared hosting service priced as low as the technical expertise required to get online. Founded in 1998, only a year after parent company Endurance International Group, iPage remains a one-stop shop for unlimited hosting. While sister company Bluehost opts to specialize in WordPress hosting, iPage offers the full range of content management systems, along with a website builder and virtual or dedicated servers. The company also supplements hosting with tools for marketing, design, and security. For the past year, iPage has concentrated on repaving the onramp customers use to get their websites online. Head of Marketing Zach Kwarta told us iPage is focusing on usability and flexibility when bringing new customers aboard. In addition to an overhauled control panel, the company streamlined the path new customers take to get acquainted with the various iPage services. Some of that approach includes making auxiliary services more accessible to customers. With the wide popularity of iPage’s integration with sister company Constant Contact, according to Zach, much of that entails prominently featuring email and marketing tools. Toward the end of 2017, iPage launched a new administrative portal to help users find various website and account management tools more quickly. According to Zach, the simplified design and navigation reduces clutter and provides a consistent user experience. The updated iPage control panel launched in late 2017 and emphasizes usability and efficiency. The sleek, modern interface emphasizes quick access to customers’ most-used tools and billing information, and Zach said the company relied on both internal and external feedback when designing the layout. With web hosting being what Zach considers “one of the most commoditized industries out there, aside from maybe bottled water,” discovering and meeting customers’ needs is critical to a company’s success. While iPage answers users’ budget restraints with some of the most affordable hosting packages around, Zach said the company continually looks for ways to sweeten the deal. In addition to 24/7 support, iPage supplies a robust knowledgebase to help customers find solutions faster. In particular, that means iPage regularly develops and expands the company’s knowledgebase and self-help tools, Zach said, so site owners can troubleshoot problems on their own instead of going through the support queue. “We have a great support team, but we’re going to continue to invest in those tools so customers don’t have to call us if they don’t want to,” he said. According to Zach, customers shouldn’t expect any major changes to the iPage formula anytime soon. Although he said he expects a few minor tweaks and optimizations, customer experiences will largely remain the same. “We’re really continuing to get better at making sure our customers are happy and want to stay with iPage,” he said. According to Zach, iPage chooses to focus inward on the company’s products and user experiences. 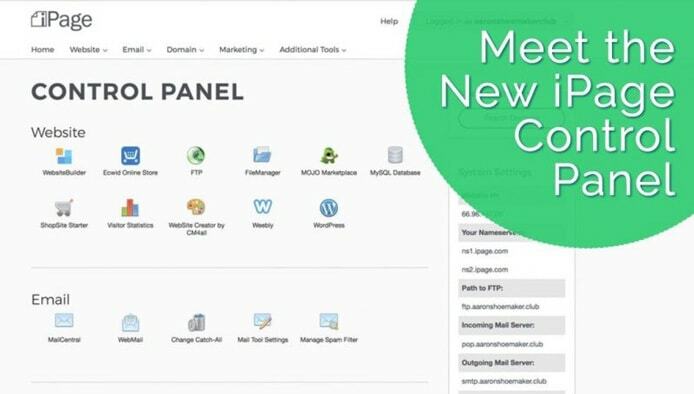 Instead of hopping on the artificial intelligence-powered website builder craze of late, iPage chooses to make measured improvements and better integrations with its WebsiteBuilder. Zach said he expects iPage to slowly and naturally adopt new technologies as customers request a particular feature, rather than rushing into new and untested solutions.